Outgoing Senate Chairman Raza Rabbani on Friday in his farewell address to the Upper House, said that he had always tried to uphold the supremacy of the parliament. "I am thankful to them and I beg pardon also, because I understand that there were instances when, as I sat here, I spoke with severity. It was not because the Senate chairmanship was clouding my mind ─ I am a darvesh man, I have tried to kill my ego ─ it was because it appeared to be the best way for this House to function," he explained. He credited his success as a political worker to two women: his mother and his "political mother", the slain PPP leader Benazir Bhutto. Rabbani said he always strives to abide by "Bhutto's legacy" of never compromising on principles. As speaker of the Senate, he hoped that his name would be written among those who always upheld the supremacy of the parliament. Rabbani thanked the 103 senators "without whose cooperation and affection it would not have been possible for this House to function". The outgoing Senate chairman said there was an immediate need for "intra-institutional dialogue" to bury the insinuations of "clash between different state institutions". Rabbani stressed that for the country to function smoothly, each institution must work within its constitutional ambit. "Army is an institution as well and it comes under the executive," Rabbani stressed. "We need to introspect and see if we have committed a mistake," he insisted and criticised the politicians for leaving a "space" in the parliament. Referring to ongoing criticism over Senate elections and the allegations of horse-trading, Rabbani recalled that the Senate had passed a report regarding election reforms and forwarded it to the parliamentary committee. "However, the committee rejected the reforms." Rabbani said the Senate had recommended that names of lawmakers must be written on ballot paper in order to end secrecy of the ballot so that polling can be transparent. "Yet every party rejected those suggestions," he maintained. He was of the view that in order to maintain the supremacy of the parliament, Article 89 of the Constitution (power of the president to promulgate Ordinances) must be "deleted". Talking to reporters after his farewell speech, Rabbani avoided questions regarding his return to Senate following PPP co-chairman Asif Zardari's earlier refusal to support the former as prospective chairman. Zardari had also accused Rabbani of failing to resist "anti-democratic" moves by former premier Nawaz Sharif. Later in the evening, PPP Chairman Bilawal Bhutto Zardari met Rabbani and praised the veteran politician for his services for the party. The meeting took place in the backdrop of recent political developments revolving around the Senate elections. 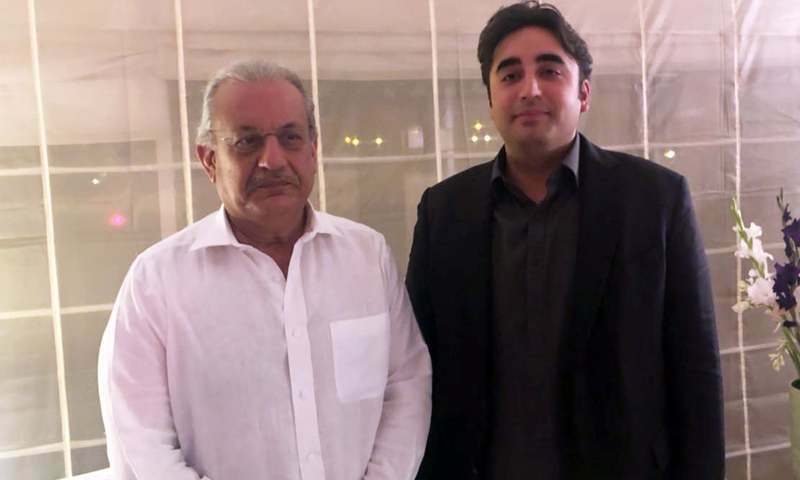 Rabbani assured the PPP chairman that he will continue to play an active political role in whatever position the party leadership assigns him. 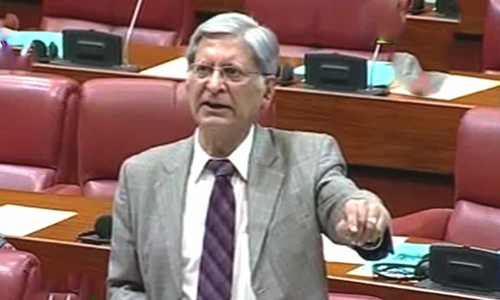 Earlier on Thursday, while giving his farewell speech, PPP Senator Aitzaz Ahsan has said that "those attacking the higher judiciary of the country in speeches and rallies" were creating the space for a dictator to overthrow the democratic setup. In what he himself had described as a "heartfelt speech", Ahsan said on the floor of the Senate that the judiciary seemed to be dealing with its critics with too soft a hand. 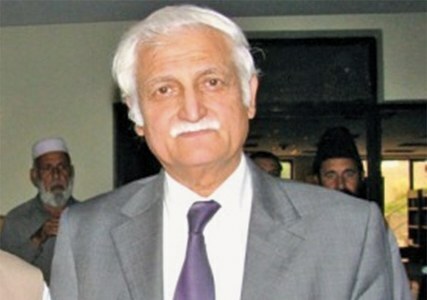 Before Ahsan, it was PPP's outgoing Senator Farhatullah Babar who warned against the "judicialisation of politics and politicisation of the judiciary" and the existence of a "state within state". 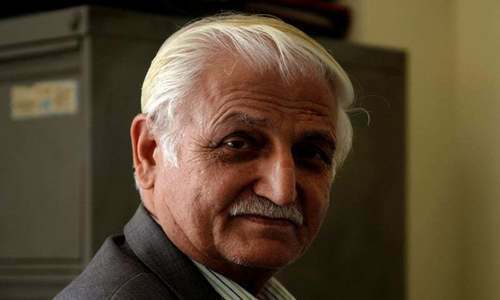 Babar had said he was distressed that all political parties, including the PPP, initially demanded across-the-board accountability — a suggestion for bringing judges and generals under the purview of accountability laws — but suddenly backtracked on it. The Senator's criticism of his party in the speech had angered Zardari, and subsequently Babar was removed from the post of party spokesman. Pls Reza Rabbani give honest opinion of present election of senators how they elected ? Now he can retire in comfort and peace and leave all the nonsense behind. With the Zardari's tirade, Rabbani must resign from politics or join Muslim League. "Always upheld the supremacy of parliament, Rabbani says in his farewell address"
But the honorable Chairman of the Senate NEVER uttered a word against rampant corruption by the senators!!!! Raza Rabbani shows maturity and does not criticize Zardari. Lets see how it plays out for him. He is a great parliamentarian always tried for the supremacy of parliament and in today’s situation best compliment for him that zardari didn’t pick him for chairmanship. Its time for a person of his stature to join the ideological path for a true democracy now! Go and start weeping and make darma... You bring bill in the Senate to approve nawaz sharief as a party head. One of the few honest ideological people left in PPP. After the assassination of Benazir Bhutto, same people like Farahatullah Babar, Raza Rabbani, and Aitzaz Ahsan agreed to accept then 19 years old Bilawal as the chairman of PPP and his father AAZardari as a care taker. They mutually laid the foundation of dynastic politics.AAZardari is the kingmaker, his word is the law that no one can challenge.What a democracy! This is the right time to say good bye to active politics. U achieved everything with grace. Good bye. You will always regret to be a stooge of a family owned and family operated political party, where the only criteria instead of merit is inheritance, inheritance and inheritance. What a shame? good work is never wasted even opposits will respect it. he is in good books ,should leave pp gang & join with good group. Very bold and strong personality. His tenure will be remembered, One of the very few parliamentarians having good reputation. Should have been given another chance but unfortunately crook politicians do not want such person to be in front. He represented a party whose current leader has accumulated wealth through questionable means, and he didn't utter a single word or questioned it. A self proclaimed honest parliamentarian and constitutional expert, who presided over senators who became senators through horse trading. He ignored the obvious wrong and try built a building on weak pillars. He is not done yet, he will be back again, this time with PML-N. Invitation has already been extended. Farewell Mr Rabbani. And thank you very much for raising the standards of the National Senate. Supremacy of parliament? Are you sure? Person who accepts the most corrupt politician as leader and serve a family dynasty, cannot be a believer in democracy. It's the people like Aitezaz, Rabbani and Baber who stalled democracy in Pakistan by serving the worst instead of promoting youths in strengthening the grass root politics. I would say good riddance. With AZ surprised outburst against Rabbani, it will be sensible of him not to contest but think his future alignment with ppp. Only dead horses stay in PPP.